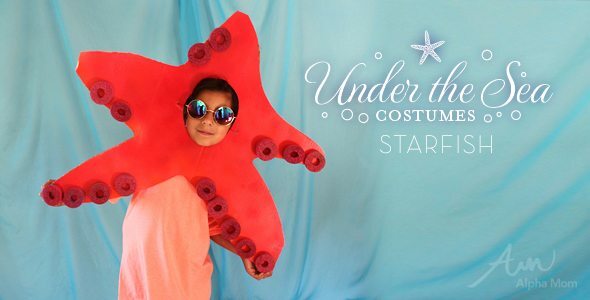 Did you want to make a cute little Starfish Costume for Halloween? Out of cardboard and pool noodles, no less? You have come to the right place! Please scroll down and observe these very simple steps. This costume is the last one in our Under-the-Sea Series. First, cut a five-legged star out of your cardboard. Don’t worry about being perfect. In fact, the more rounded and wobbly the starfish arms are, the better. That way your starfish will look like he’s squishing along the ocean floor one suction cup at a time. Cut a hole in the center for your child’s head (or your head). Next you’ll need to cut your pool noodle into 1 inch segments. It’s easiest with a serrated knife but be careful and use a cutting board so you don’t cut your table or your hand while you’re at it. Ahem. That’s never happened to me. Nope. Once all your paint is dry, it’s time to glue. This part is a bit tricky. I did use hot glue but hot glue melts pool noodles so you have to do it just right and fast. If you have more time I’d recommend regular non-toxic white glue or any quick drying glue. Just make sure you let the glue harden so those suction cups are secure and not sliding off on Halloween night (code for: plan ahead). You’ll also need to punch two holes on either side of the face hole and attach some ribbon so you can tie it on your head on Halloween night. That’s it. Add some solid colored outfit under the costume (blue might be nice to look like water) and you are ready to charm everyone with your starfish cuteness! Crafting time: 1/2 hour to an hour, depending on how fast your paint and glue dries. Maybe even a whole day if you are using slow-drying glue. *Always spray paint outside or in a very well-ventilated area. Use non-toxic (low VOC) spray paint or ask your paint store to put no- or low-VOC paint into a spray can for you. **Box cutters are NOT for children. Have a responsible adult use any sharp cutting devices. ***Serrated knives are NOT for children (and not even some adults!). Have a responsible adult use any sharp cutting devices.